Songs: Since I got my pretty red iPod for Valentines Day I've been sort of going crazy with the iTumes downloads. 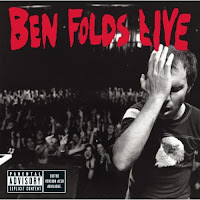 This week my most favorite download is the live version of Ben Folds covering the Elton John classic Tiny Dancer. I can't stop listening to it! Usually live recordings drive me crazy. All I can hear is how I would have mixed it differently, or where I would have placed the mics, or how I would have boosted this and put more of the room mix here and tried to compress that a little... But every now and then I get a live recording that really captures the essence of something. By far, the best 99 cents I've spent in a while! Biggest guilty pleasure download: Shoop by 80's sweethearts, Salt-n-Pepa because it makes me wanna shake my booty. Best Software Download: a friend of mine turned me on to something that has changed my life. For the price of two CD's you can get this awesome little bit of software that will let you record ANYTHING that streams online. This means you can record any of those songs on Myspace that are not set for download. (Not that I would do that because that would be illegal, just saying that you could.) In theory one could use this to make MP3s from any live radio stream, any Myspace profile that have unreleased versions of songs up, or even your Skype conversations, making it perfect for Podcasting! Who knows, maybe I will get really lucky and get to meet Mr. Robert De Niro. But what do you say to a living legend? (Anything will be better than babbling about jalapeno poppers like I did at Shatner when I first met him.) Must repress urge to say, "Are you talkin' to me?" The word surreal keeps coming to mind. Does this wig make me look smarter?